Like Aurelien, I had a surprise in my (physical) mailbox yesterday, and a very similar one to Aurelien’s, even. Some months ago, I had written an article for the German edition of Linux Magazin User explaining how the semantic desktop works in KDE’s applications and Plasma. It’s a very user-centric article that also gives some background information about how Nepomuk (KDE’s semantic and search technology) goes way beyond what desktop search provides. The article, while focusing on KDE SC 4.4, which is already a good 8 months old is still largely valid, though performance and usefulness of various Nepomuk components has gone up quite a bit, here and there it even has become second nature when using my desktop or laptop. I’m especially pleased by the on-demand scanning of metadata in Dolphin, so you don’t have to index all your potentially interesting files, just to get metadata. When writing articles, the wordcount now shown in Dolphin is a must, when editing images, the size of the image displayed in Dolphin is one big time-saver. The copy of the magazine I got in the mail yesterday was an English translation of the German article, and already got published in June. The mag must have been stuck in the mail queue for a while, as I’ve only got it now. Nice surprise, though. Very nice, I’m an avid reader of Freies Magazin, you guys are doing great work! Looking forward to reading your article. If you want me to look over it, drop me an email. 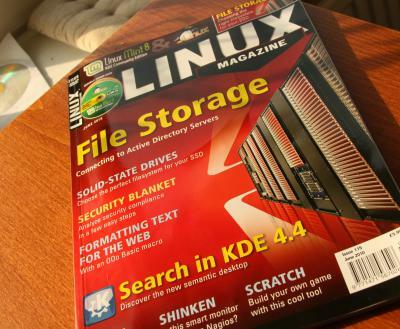 Btw, the original article was not printed in “the German edition of Linux Magazin”, but in LinuxUser 04/2010. Same publishing house, totally different magazine and editorial staff. Anyway, thanks again for the fine article – I learned a lot about the semantic desktop. Right, i’ve changed it above. Thanks for the link to the German version of the article.